Instrument building show and tell: Circuit-bender and hardware DIYer Chachi Jones writes to say he’ll be leading a very cool session for maker/musicians: Making Instruments, Making Music, with show-and-tell, Q&A, and jamming. Musical Instruments for the Motorcycle Enthusiast: The title alone pretty much says it. 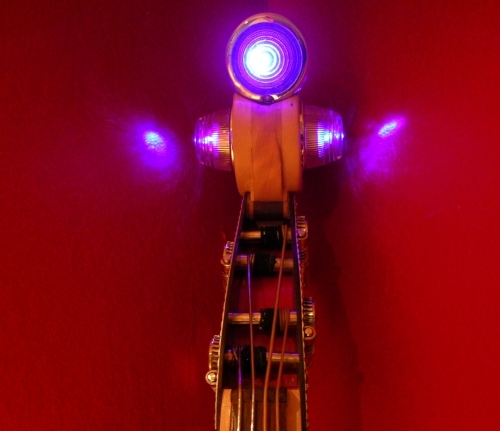 An upright bass built out of a motorcycle (pictured hered) and other creations: it’s like Zen and the Art of Motorcycle Synthesis. More weird custom interfaces on their site. Speaker in an Ottoman: Because, really, music and furniture just go together — see CDM’s inexplicable ongoing series. Wireless Networked Toys: I’m sure there are plenty of musical applications lurking in the tech here. There’s also a circuit bending workshop, a reappearance by the Improbable Orchestra installation as seen at Burning Man (and covered here on CDM), live looping with found and invented instruments, and lots more. Watch for our full report!